Super Gerball - now on iOS! A new version of Super Gerball for iPhone and iPad! Gerry the gerbil is on the loose! Gerry the gerbil loves playing in his ball - he would play all day long if he could. Unfortunately though, the house in which Gerry lives is not safe - if he is not careful, he will fall and hurt himself. This is where you come in. You must guide Gerry around the 60 levels contained within the house, making sure he does not fall off the edge of any of them. Your job is made harder by the numerous obstacles left lying about - if Gerry touches these, he will be pushed away - and possibly off an edge. There is also a time limit to contend with - Gerry must complete all the levels by midnight. If Gerry completes a level, he will dance a jig in celebration. It is up to you to make sure he dances all day long - and is still dancing at the end of the night. Click on a screenshot to see a bigger version! More screenshots are here. Touch a spring and it will give you a speed boost - handy for getting up steep ramps or over large gaps. Super Gerball features a large variety of ramps, drops and loops for you to roll along at high speeds. 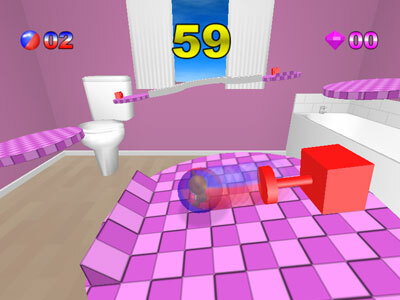  60 levels - 60 fun, exciting levels provide a long-lasting challenge. Each level has been designed to offer something new, with no two levels alike - ensuring a fresh experience from start to finish. 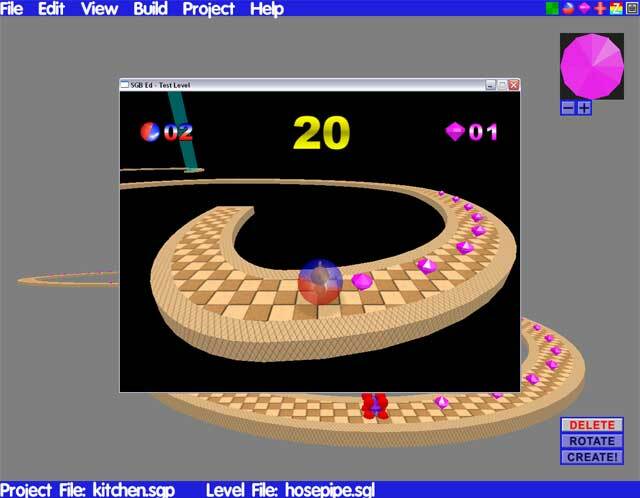  6 game zones - Super Gerball provides you with the ultimate in graphical variety - there are no less than 6 game zones in the game, starting off in the garden and moving onto the garage, kitchen, bedroom, bathroom and attic.  3 difficulty settings - easy, medium and hard modes make the game accessible to everyone and also provide lasting challenge. Start the game off in easy mode, and then as you get better try mastering the medium and hard modes!  3 unique endings - complete the game in easy, medium or hard mode and you will be rewarded with an entertaining end sequence - completely unique to that mode! Do your best to see all 3 endings! 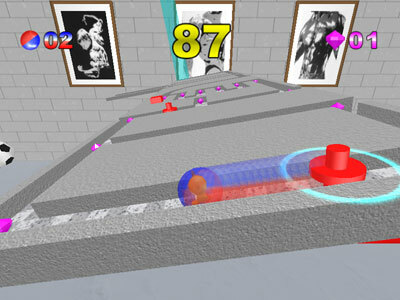  3 high score tables - compete against friends and family to see who is the best Super Gerball player of them all. Can you reach No. 1 in all 3 tables?  Freeplay mode - play any level in any order and try and beat your best score for that level.  Easy to use - normally, 3D level editors can be horribly complex to use - but not Super Gerball's editor (SGB Ed). SGB Ed has been designed to be useable by anyone whether they've used a 3D editor before or not.  Powerful - Super Gerball's editor lets you do everything that can be done in the game - so you can create levels just as simple or as complex as you want.  Complete and thorough documentation - the documentation for SGB Ed explains everything about the editor, so you should never get stuck. To take a look the documentation, please click here.  Support and community - already there is a community of Super Gerball full version owners who are creating their own levels. Get the full version and join this creative community! 1. Create a few 3D blocks to form the shape of the level. 2. Paint the blocks so that they have some colour. If you want, make the brushes scroll, or make them slippy or rough! 3. Set the start and end points - every level has to have a start and end point, of course! We just click where we want these to be. 4. Add some crystals - let's add some crystal for Gerry the Gerbil to collect. 5. 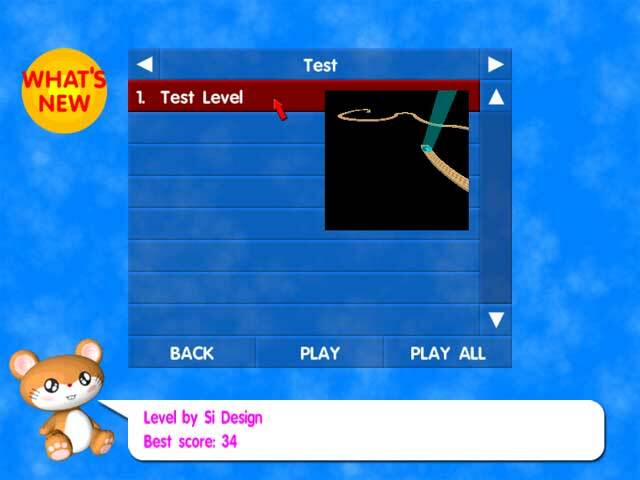 Test the level - Just select 'Test Level' to actually play our new level! 6. Create a level pak - now we have finished creating our level, we can create a level pak and add it to Super Gerball itself. That's the end of the guide. This is only a simple example - if we wanted to, we could have added lots more things - buzzers, springs, ball boxes, platforms - the possibilities are endless! Play the full version of Super Gerball within one minute - as you soon as you have ordered the game, you can download the full version. If you're not completely satisfied with Super Gerball within 30 days of purchasing it, let us know and we'll offer you a full refund - no questions asked. Become a fan of Super Gerball on Facebook!